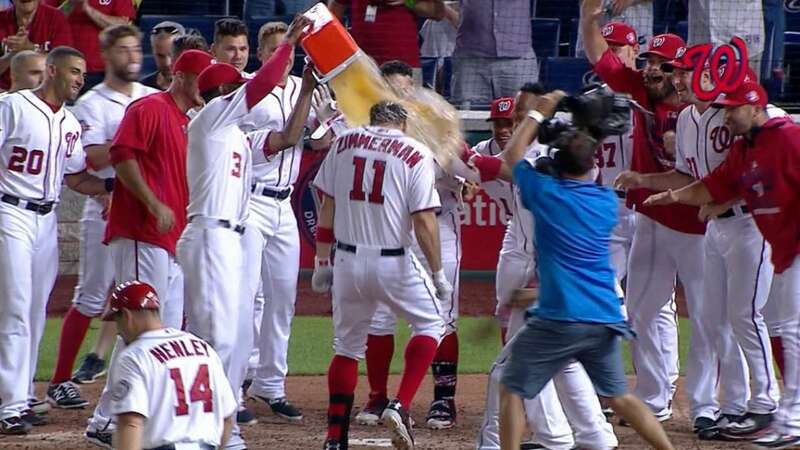 Its been a little while since Ryan Zimmerman hit a walk-off home-run (about two years) but on Friday night 7/26/13 he delivered again, giving the Nats a second walk-off win in two days. A 2-run walk-off against Chien-Ming Wang on Fathers Day 2006 against the Yankees, a game in which the team set its long-running regular season attendance record (only surpassed on Opening day 2013). A 2-out, 2-strike come-from-behind homer against Florida on the 4th of July that same year. 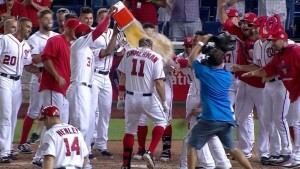 Zimmerman had accumulated no less than eight walk-off homers by the end of his 6th professional season in 2011, and he seemed a sure bet to shatter the all time MLB record for such events. The long-standing record for career walk-offs was shared by this quintet of Hall-of-Famers at 12: Jimmy Foxx, Mickey Mantle, Babe Ruth, Stan Musial and Frank Robinson before one Jim Thome hit his 13th in June of 2012 to take over the career lead just before he retired. Friday’s was Zimmerman’s 9th, and you’d have to think he remains a good bet to possibly take over the career lead before his career (which is seemingly only about half way done) is over. The current active leader in walk-offs is another noteworthy name; David Ortiz connected for his 11th such walk-off homer on 6/6/13, as detailed by Billy-Ball.com. Ortiz’ most noteworthy walk-off homers though are the post-season variety, not captured by these regular season records. 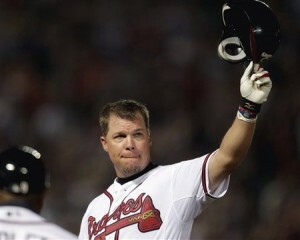 Zimmerman has had a 2 year walk-off drought; will we see another moment of magic later this year? As we get started for a new season of Nats baseball, one with incredible promise and high expectations, I thought I’d put out a fun post for retrospection for all us Nats fans. What are some of the best Nats games you’ve seen in person? This post is inspired by a post from William World News, he himself inspired by another post (so this is transitive blog post inspiration here). 1. Nats Park Opener 2008: I caught a 4am flight from a Vegas bachelor party to make it. We had nosebleeds up in the left field bleachers but Dad and I stayed for the whole game. Jon Rauch blew the save and gave up the lead in the top of the 9th and we all groaned; it was late on a Sunday night and very cold. Dad and I had metro’d down and started making our way back to the train, thinking that with the cold there may be a long set of extra innings when suddenly Ryan Zimmerman blasted a walk-off homer to win the game. Very special game. 2. Ramon Ortiz taking a no-hitter into the 9th on September 4th, 2006 at RFK. We basically saw the greatest game of Ortiz’s career as he shutdown the powerful St. Louis Cardinals on zero hits through eight. Ortiz also managed to hit the SOLE home run of his career that night. In the top of the 9th he gave up a hit … and then promptly served up one of the longest home runs I’d ever seen to Albert Pujols, who blasted a ball to dead-center field at RFK that landed in the upper bleachers. Before Pujols had rounded first base Frank Robinson was out of the dugout to pull Ortiz and let Chad Cordero get the save. Looking at the box score it was an awfully fast hook; there were 2 outs in the 9th, the Nats were ahead 4-1 and Ortiz was only on 95 pitches. Why not let him get the CG? Still a special game. 3. Fathers Day versus the Yankees 2006: Zimmerman walk off again for come-from behind victory, closest RFK ever came to being full outside of the 2005 opener. The stadium was absolutely buzzing that day and I was dutifully in tow with my own father (along with good friend Pat Boyd and his dad, a diehard yankee fan). The same group was also at the 2012 Nats-Yankees series, and we saw the game where Bryce Harper struck out 5 times. 4. NL East clincher Oct 1st, 2012; entire crowd singing “Take On Me” when Michael Morse came to the plate, and then despite being behind in the 9th the Nats clinched the division when the Braves lost, which was announced in the middle of the 9th inning as the mobile-phone enabled crowd started cheering and the announcers were forced to post it on the scoreboard. The Nats were listless that game, getting just 4 hits off of Kyle Kendrick in 7 innings and seemed distracted. But it was all worthwhile for the champagne celebration afterwards. 5. First home game as a franchise: April 14 2005. The new Washington franchise played its first 9 games on the road, ostensibly to give the Nats their own stage for their first home opener. Thanks to George W. Bush‘s attendance, the line to get into the stadium was an hour long and we missed the first inning entirely. But we got in, the team won behind 8 strong innings from Livan Hernandez and a tradition was started. Coincidentally, Zimmerman now has 8 career walk-off home runs, a distinct penchant for the dramatic. Which is a ton considering that the career record is 13, belonging to Jim Thome. Can Zimmerman keep getting these marquee home runs and put his name on this list? He seems to have a long career ahead of him and plenty of time to hit a handful more walk-offs (myworldofbaseball has a nice description of each of Zimmerman’s 8 walkoffs). – Strasburg‘s debut: June 8, 2010; my family was in South Africa for the World Cup 2010 so we missed it. However, I remember my dad distinctly telling me Strasburg’s line on the day. 7ip, 14Ks, 0bbs. And I thought he was kidding. – Teddy Wins! After years of losing, many people had given up hope that Teddy would ever win. I thought personally his best shot was his Bobblehead day, when “secret service” members guarded him as he tried to finally cross the finish line first. But it was not to be and I thought perhaps he’d never win. As it turned out, the prerequisite to Teddy winning was the Nats themselves winning a title, a fitting end to his losing streak. – Any of the 2012 playoffs, but especially NLDS Game 4 walk-off. Probably the most special moment in the Nats short history. I did not “win” any playoff tickets out of my season ticket groups and watched the game from home, on tape delay. Amazing finish. I have a photo of Jayson Werth stomping on home plate framed in my son’s room now; ironically its the same photo that now adorns the side of Nats Stadium. – Final game at RFK: I may have been there frankly. That was a long time and a lot of losses ago. If I was there, It didn’t turn out to be nearly as special as it could have been. What are your best Nats game memories?